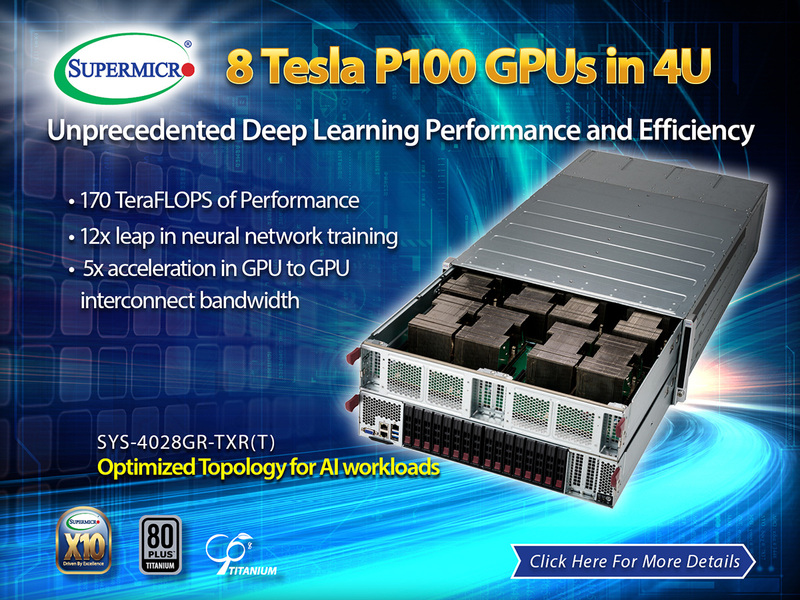 Supermicro’s SuperServer 4028GR-TXR(T) supports eight NVIDIA Tesla P100 SXM2 GPU accelerators in 4U to provide maximum performance for mission-critical HPC clusters, Hyperscale and Deep Learning workloads. This solution incorporates the latest NVIDIA NVLink™ GPU interconnect technology in a cube mesh architecture and RDMA fabric to improve latency of data access and transfer and maximize performance. This SuperServer provides the best performing eight Tesla P100 SXM2 GPU accelerator parallel computing solution, and with independent GPU and CPU thermal zones which ensure uncompromised performance and stability with up to 170 TFLOPS FP16 of peak performance.